Reptoids slot is an Yggdrasil Gaming based video slot game of 5 reels an 20 paylines. Total coin size for this slot game is 20; however you can play this slot using coin sizes of 10p to €£100 per spin. The slot offers a jackpot of 100,000 coins and there are 2 bonus rounds available in this game which would offer you 7 to 13 free spins plus up to 10x multiplies. 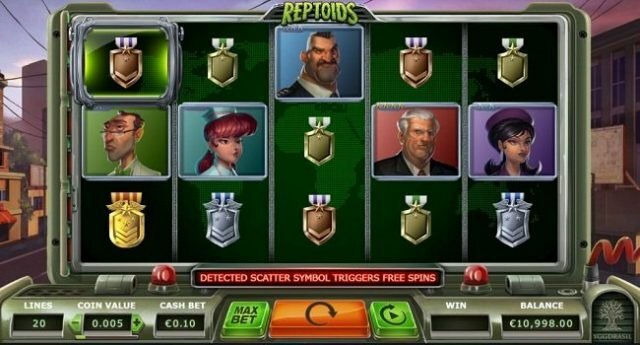 Reptoids Slot is based on aliens (Reptoids) who are taking over the world. 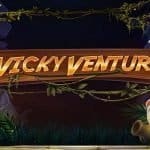 This video slot is very adventurous and you can play this game either by using your desktop, laptops or mobile and smart phones at any Yggdrasil Gaming casinos. There is a Repto Detector feature available in this game and if any symbol falling in this feature (framework) then that symbol turn in to wild symbols and will create great winning combinations for you. The game also includes a high value scatter which would offer you 5,000 times of your total bet, if you land 5 of these symbols across a payline. Reptoids slot includes symbols like reporters, president, nurses, generals, cops and scientist. The game also includes bronze, nickel, silver and gold military medals. The president symbol of this slot machine is the highest paying symbol which could offer you 50 times of your total stake if you land 5 of these symbols across a payline. The gold coin is the scatter symbol in this game and if you hit 2 of these gold coins then you will receive 1ties of your total stake. 3 of these scatter will offer you 101 times of your total stake and 4 and 5 of these Gold coins on active reels will give you 1,000 and 5,000 times of your total stake, which simply is very awesome for a game like this. The aliens are wild symbols in this game and they can substitute all other symbols except the scatter. If a player lands the scatter symbol in the detector frame then free spin feature will be triggered and you will receive 7 free spins. 2 Additional spins can be awarded to you if you detect 2 Reptoids. 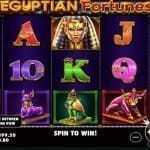 In the mean time, if you are able to detect all Reptoids, then you would get an extra 6 free spins. 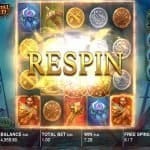 Reptoids Slot is simply and awesome slot game from the house of Yggdrasil Gaming.